From an awesome Italian chef. There are many versions of this delight from Spain. Almost every different culture in Latin America and the Caribbean has their own version of Arroz Con Pollo. However, this is the one I discovered while studying abroad in Madrid, which would be the original version from which all others are derived. Even the cooking Bible of culinary art Larousse Gastronomique refers to this dish as Castilian Chicken. Please note that although the Arroz Con Pollo in Spain will use different cuts of chicken that I use. Why? Because I’m completely grossed out by eating meat with bones in it. Start by steeping the flavorful spices in the broth. You don’t boil this mixture. Put it on your lowest setting in an uncovered pot for 45 minutes to 1 hour. *I usually do not measure this ingredient. I buy the McCormick Saffron threads and use half. Therefore, I get to make this dish twice from one bottle. Prices vary drastically. I’ve seen it at Walmart for $17.69 while the base commissary has the exact product for $9.49. Dredge the chicken pieces and shake off excess. There are many incarnations of the Chorizo, like Mexican and Basque versions. However, the type made by Goya is the one that fits the bill. These match what I had in Spain and in the better Spanish restaurants in New York City. This type of cooking is made for Le Creuset enameled cast iron. Yes, there are cheaper alternatives. I’ve seen them in Walmart and Bed Bath and Beyond. Although I’ve never used other brands, I swear by the quality of Le Creuset. My mom has some for over forty-years. Start by placing the chorizo slices in a large pot (preferably like the one named above). Remember when it comes to any type of sausage, low and slow is the way to go. Once the chorizo has some color on them, remove and reserve. As you can see, the chorizo has rendered beautiful red-orange colored drippings. Put the olive oil and fry the chicken pieces. You don’t have to cook them all the way through. You want some golden brown color. Remove and reserve with the chorizo. Next add the veggies to the oil. After they become a bit soft you can sweat them. You don’t have to remove the onion and peppers. Now toss in that splash of White Wine and deglaze. Just simply add the rice to the pot and get the rice coated in the oil and cooked a bit. Then add that broth that has been steeping for a while. Add the cooked and chorizo back into the pot and cover. Treat it as if you are making plain rice. When it starts boiling, lower the temperature to the lowest setting for 20-25 minutes. Uncover and add the pimiento and olives (remember the olives are optional). Residual heat will warm those last two ingredients. Mix them in and serve. I hope you try this one. Let me how it came out! An undercurrent of animosity, name-calling, swearing, and insult-laden discourse (Italians are very good at that skill) has been brewing on social media lately. Of course, Facebook and Twitter did not cause the dilemma, but rather, social media is the delivery system which has allowed Italian enclaves from coast to coast to have a verbose brawl over a simple question. Do you call it sauce or gravy? That succulent culinary companion for many different pasta dishes revered throughout the world. And sometimes, a family recipe guarded by Italian grandmothers (with wooden spoon weaponry) like a high level classified state secret. Hopefully, within this humble post, I will settle the sauce / gravy question, once and for all. To make my claim plain and simple, Gravies contain meat drippings and sauces do not. The fat or oil for a sauce is usually butter, and the thickener in common is of course flour. Yes, I am completely aware of other sauce / gravy techniques from the table of world cuisine. A German chef may add crushed ginger snaps or farina to thicken, while an Asian chef will rely on cornstarch. And who can forget Greek Taztziki sauce, based upon yogurt. Now let’s take a look at a sauce and gravy which are based upon the same main ingredient. Béchamel sauce and Sawmill gravy are milk oriented. Béchamel is a mother sauce used in Lasanga, or making Bernaise and Mornay sauces. For a Béchamel sauce, milk is thickened by a butter and flour roux. Sawmill gravy is that wonderful concoction from the American South used on Country Fried Steak or for Biscuits and gravy. In Sawmill gravy, flour is sprinkled into crumbled breakfast sausage and its rendered drippings, then milk and seasonings are added. Both are milk based, but one uses meat drippings and the other uses butter. The words sauce and gravy are differentiated in the same way in Italian, sugo for gravy and salsa for sauce. For instance, beef gravy in Italian is sugo di manzo and the aforementioned Béchamel sauce is salsa besciamella. Therefore, if you didn’t use meat, it is a tomato sauce. If you add meat, it is a gravy. Like my grandmother, mom, aunts, and sisters, I’ve always used both terms depending upon whether it was a tomato sauce (meatless), or gravy for big Sunday family meal with meatballs, sausage, and bracciole. It is simply a matter of applying the proper culinary terms. Are you ready to make peace with your paesani? Let’s end this terrible bloody battle and usher in a modern Pax Romana. The glorious tomato is a bright star in the culinary universe. Think about all of the different possibilities that can be done with this versatile ingredient. From cream of tomato soup, an Italian sauce, salsa from south of the border, an essential element of a BLT, to part of a salad…the list of versatility can go on forever. However, the tomato conjures up one of the most perplexing conundrums, is it a fruit or a vegetable? Surprisingly the tomato is both; it just depends upon who is going to answer the question. From the legal viewpoint: The tomato is a vegetable. The Supreme Court of the U.S. declared it to be a vegetable on May 10, 1893. A decision was necessary because of U.S. tariff laws. From a Scientific viewpoint: The tomato is a fruit. Botanists consider all plant life to be “vegetation.” However, they classify fruit as the edible ovaries of a plant. Certainly our friend the tomato clearly fits into their fruit definition. From a culinary viewpoint: The tomato is a vegetable. It can be part of an appetizer, a soup, a side dish, or an entrée unto itself. However, a vegetable can never, ever be part of a dessert. Is it any wonder that I despise the very existence of Carrot cake? The final definition was the determining factor of the tomato’s legal status. Although scientifically a fruit, the government classified it as a vegetable because it was used and treated like one. So go ahead and enjoy your fresh, sweet tomatoes. Just don’t try to make tomato pudding and garnish it with chocolate syrup and whipped cream. What’s your favorite way to enjoy a tomato? For me, nothing answers the call of comfort food better than a hot bowl of Pasta e Fagioli (Pasta and Bean Soup). The rich stock, tasty bites of beans and pasta, makes this soup hearty. Of course, like an authentic tomato sauce, there are many variations of this staple of the Italian kitchen. Therefore, you’ll find different recipes in every household. I like to add small chunks of genoa salami. After all, pork and beans go well together. Perhaps at a later date, I’ll ask mom for her “lighter” white bean recipe. *The amount of salt depends on the brand of cooking stock and if it’s a low or non-sodium version. Step 3: Sauteé the onions until tender and limp, but not browned. *The nitrates in cured pork products can leave a nasty aftertaste. The sugar will cancel it out. Step 8: In a separate pot, bring enough water to boil in order to cook the pasta according to box directions. You shouldn’t cook or store the soup and pasta together. Step 9: Put one half ladle of cooked pasta into a bowl and add two ladles of the soup. 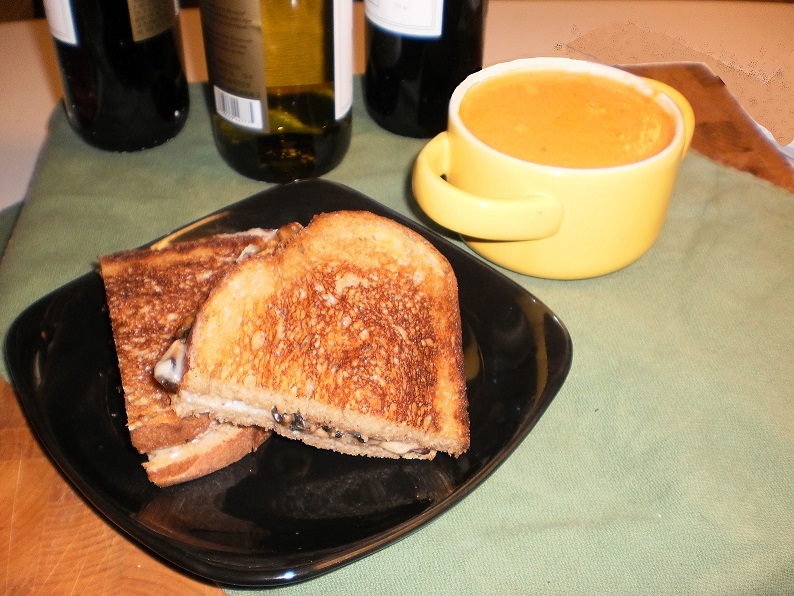 Serve with a piece of crusty Italian bread for a hearty meal. Step 10: Enjoy it! Mangia Bene! Comment below if you attempt or plan on attempting this recipe. There are many myths that circulate throughout the culinary world, most of them concerning the origins of famous dishes. However, the raw beginnings of Fettuccine Alfredo are rather well-known and accepted. 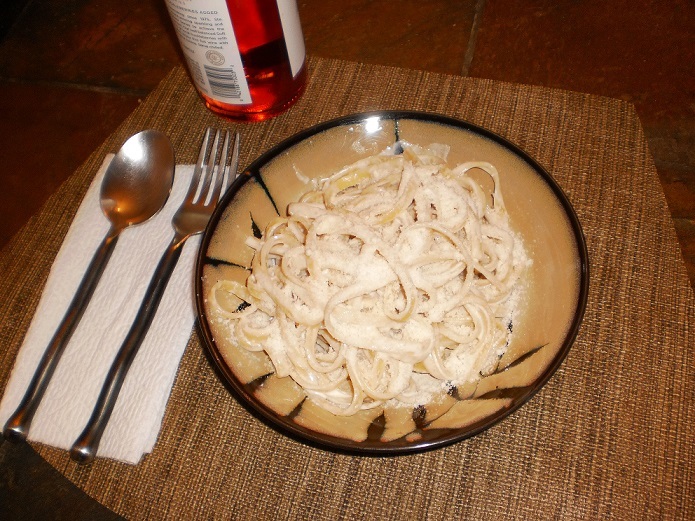 As the story goes, Alfredo first made the dish for his wife, who suffered from terrible nausea during a pregnancy (it is an old Italian custom to “eat white” when you don’t feel well). Further down the road in 1920, he made it for Mary Pickford and Douglas Fairbanks. They were so impressed that they presented Alfredo with a gift before they left Rome. Soon the newspapers caught on and ran the story, thus cementing Alfredo’s restaurant and the entrée that bears his name to the world. I like to order Fettuccine Alfredo whenever I’m trying out a new restaurant. It’s such a simple entrée that if you ruin it, maybe you should get out of the restaurant business. Too often I’ve seen this dish destroyed by either complicating it with extra ingredients, or by foolishly misunderstanding it and using the wrong preparation method. I especially cringe whenever I see jarred “Alfredo Sauce” in the supermarket. Once you read this recipe and its true technique, you’ll realize that there is no such thing as Alfredo Sauce. *If your pasta cooks in 8 minutes, then remove after 7 minutes if you’re using heavy cream, 6 for half n’ half, and so on. 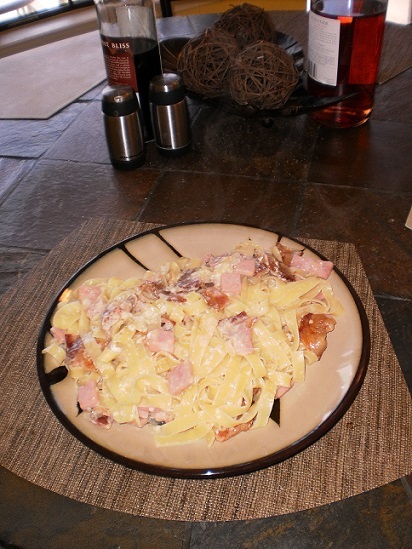 While the water for your pasta is heating, heat the butter and cream mixture in a skillet. Don’t boil it, just get it above room temperature. Drop your pasta into salted boiling water. Usually dried pasta takes 6 – 8 minutes to cook, but we’re going to remove it early. The pasta will be somewhat flexible but too hard to eat, but that’s exactly where we want it at this point. Place the pasta into the skillet with the butter and milk and turn up the heat one notch. The pasta will finish cooking by absorbing the water content from the milk / butter mixture. This also thickens the sauce. Just remember to keep flipping and tossing the pasta about twice per minute. Plate it and sprinkle your favorite grated cheese on top. I hope now you see why you can’t get Alfredo sauce in a jar. It takes dried pasta to create it. That icky stuff in the jar is usually made (and I’ve seen restaurants do this as well) with a butter and flour roux as a thickener. That pasty flour taste just does not belong in there. Another major error I’ve seen is the use of garlic. Some chefs mistakenly think that tossing garlic into a recipe makes it more authentically Italian. Wrong! There’s no place for garlic in a butter and cream sauce. Are you ever going to use “Alfredo Sauce” from a jar again? There are a few special recipes to consider now that the fall and winter seasons are coming upon us. One of those recipes is Welsh Rarebit. I love English “Pub Grub” comfort foods and a well prepared Welsh Rarebit soothes and relaxes like few others dishes can do, especially on a cold day. Step 1: In a 2 quart pot, melt the butter and stir in the flour to make a roux. Let the roux cook for at least 1 – 2 minutes. Remember, you can’t put cold butter into a hot pan. It will turn brown and nasty in seconds. It’s better to use room temperature butter and melt it over medium heat. Step 3: When the mixture has heated (not boiling) you can add the cheese and stir. The cheese will melt and absorb the liquid creating a silky smooth cheese sauce. If you let this mixture boil (or used aged cheddar) the sauce will be gritty instead of smooth and creamy. This is also a good time to toast your bread. Step 4: Move an oven rack to the highest position and turn on your broiler. Spoon the cheese sauce over each toasted slice. I like to put my slices of bread on a cookie sheet. Watch as the cheese starts to bubble and create a brown crust. It can go from golden brown goodness to black burnt yuck very quickly. Have your oven mitts ready to remove the cookie sheet instantly. Step 5: Eat and enjoy. It washes down especially well with the same beer that you used to make the sauce. I could not get my hands on a bakery quality loaf of seedless rye bread and had to opt for a country white loaf as evidenced by the photo. It was still quite yummy, and so was the beer. Is your recipe different? Let me know how this came out. This is the dish that can make chefs scream at each other. The original recipe has come a long way and has gone through many adaptations in different regions in Italy and since crossing the Atlantic, gracing the menus of Italian restaurants and trattorias in America. I can hear some of the purists already screaming at me because my first ingredient is pasta. Just to be clear, I’m not specifically calling for spaghetti. I prefer fettuccine nests. *I buy a quarter pound of ham at the deli counter and ask for it as one thick slice. ** Guanciale, pancetta, or bacon? Use whatever pleases you or what is available. If you’re using bacon from the supermarket, make sure it’s plain bacon. Don’t use anything like Apple Hickory smoked or other flavorings. Step 1: Bring the water to a boil and add the pasta and salt as per the box directions. Step 2: While the water is waiting to boil, cook your bacon and drain on a paper towel. Retain 3 tablespoons of the drippings. Dice the bacon. Step 3: Cook the onions in the bacon drippings. Add the ham, garlic, bacon and peas to the pan after the onions are cooked. Step 4: Beat the eggs and add the cheese and cream. You can also temper the eggs with 4 tablespoons of the pasta water. Step 5: Drain pasta. Add it to the skillet and toss for a minute. Remove from heat, add the egg mixture a little at a time, and keep tossing the pasta. Removing the pan from the heat is critical. You don’t want the egg to scramble. This can also happen if you add all of the egg mixture at once. Step 6: There is no step 6. Bring that pasta to the table and eat it while it’s hot. Enjoy! One of the fringe benefits of having an Italian ancestry is never developing a taste for instant food. A side benefit of being an Indie Author is to be able to write about the wonders of the Italian kitchen. * Dried thyme is potent so be careful if you substitute. Just add a pinch and adjust as necessary. Step 1: Quarter the tomatoes and remove the seeds. Toss the tomatoes in olive oil, salt, and pepper. Place in a 325 degree oven for 20-25 minutes. Step 2: Heat the 3 Tablespoons of olive oil in your soup pot and cook the carrot and onion. Step 3: When the onion and carrot are soft (not browned), add the stock and thyme. Step 4: Add the roasted tomatoes, and any other juices into soup pot. Let the flavors mingle for a minute or two, then blend (use a blender, food processor, or immersion blender) to a fine consistency. *Steps 1-4 can be done ahead of time. This should yield 4 crocs of soup. Step 1: Slice the mushrooms* and sautée in the olive oil, pat of butter, sage, and salt and pepper until brown. 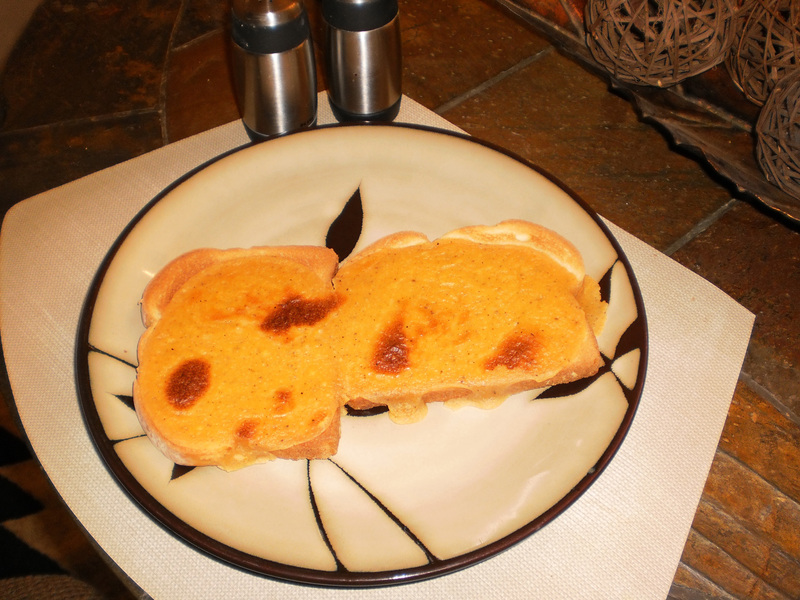 Step 2: Brush the bread olive oil and melted butter and toast in a dry pan. Remove and brush the untoasted side. *Remember to either rinse or clean the mushrooms with a tea towel.